It’s that time of the year, so in this episode, I’m going to walk you through how to get publicity during the holidays. Earning media exposure is all about timing. I’m going to teach you how to use the holidays to position your product or service as something newsworthy for members of the media to cover between now and the end of the year. Today I am taking over the mic on my own podcast. I decided I’m going to do this every month instead of every quarter just because I’ve gotten some great feedback on my solo episodes and you guys tell me you want more, so I am going to give you more. Today I am talking about a very timely topic – holiday marketing ideas. So whatever your business, whatever your brand, whether you are a product based business or a service based business, I am going to give you some great holiday marketing ideas to reach more people before the end of the year. All right, let’s get into it – holiday marketing ideas. So, the first tidbit that I want to share with you is making this timely because it’s the holidays. So that’s the angle we’re going to go with, right? You have to be newsworthy. I say this to all of my clients year round and right now the newsworthiness is going to be the holiday angle. Most of that is going to be in the form of gift guides. This time of year, I tell all of my clients that if they have a product, this is their Super Bowl because everybody is putting together gift guides. There are gift guides for travelers, gift guides for entrepreneurs, and gift guides for kid’s gifts under $100. Any kind of gift guide you can think of. One of them exists and you have great opportunities to get in them, especially this time of year. I just did a roundup on WPTV, which is the NBC station in the West Palm Beach market, and I’m usually there every month, every other month. It’s just hosting a quick fun segment and the last segment that I did was sharing four or five different products for everybody in the family. So I did one for the cook. I did one for the expecting parent. I did one for the drinker, things like that. It worked out well. You definitely want to start now. In fact, you should have started a couple of months ago, but you can still get in those gift guides now. Honestly, you can still get in those gift guides almost up until Christmas Eve because there are gift guides for the last minute shopper. I’m actually hosting another segment on the NBC station in the Miami market, the one that I used to work at for about four years and we’re shooting that on December 10th, but it’s not going to air until December 21st because again, the angle is the gift guide for the last minute shopper. So, we’re going to include all gifts that you could order on the 21st and get them in time for Christmas. One thing to talk about is lead times for magazines, TV, and online. So obviously online content you could create the day of and it could be published the day of. (You don’t want to do that because a lot of journalists plan things in advance and they don’t want to be rushing at the last minute.) However, because of the way online media works, you could potentially put something together today and it could go live online but with TV you’re going to need a week or two of lead time. For example, the segment that I did in the Palm Beach market that I mentioned earlier. That was probably scheduled about two weeks before we did it. Another segment I’m shooting later on in December has been scheduled for a few weeks. It’s not going to shoot until the beginning to middle of December and then again it’s airing on the 21st. TV is scheduled anywhere between up until a few days to a few weeks ahead of time. Then there’s long lead magazine work. That stuff is three months in advance and when we’re talking gift guides, I think the most popular gift guide and the one that everybody wants to be in is Oprah’s. Her annual list of favorite things is actually collected starting in July and August. By the time September and October roll around, she is done and everything is decided on. I can’t even imagine how many things she gets sent to her. Probably hundreds if not thousands of products, but those glossy magazines that you see when you’re at the grocery store checking out, those work at least three months in advance. For example, for their November and December issues, they’re actually putting those together at the end of the summer, beginning of the fall. You definitely want to plan ahead for those. But again, TV is a little shorter. Online is even shorter. So something to keep in mind, you didn’t miss out on anything this year. Don’t worry, you can still get some TV stuff or you can still get some online stuff, but for those long-lead magazines and Oprah’s favorite things, you definitely want to put something in your calendar for July or August just to remind yourself that hey, those glossy magazines are working on gift guides right about now. 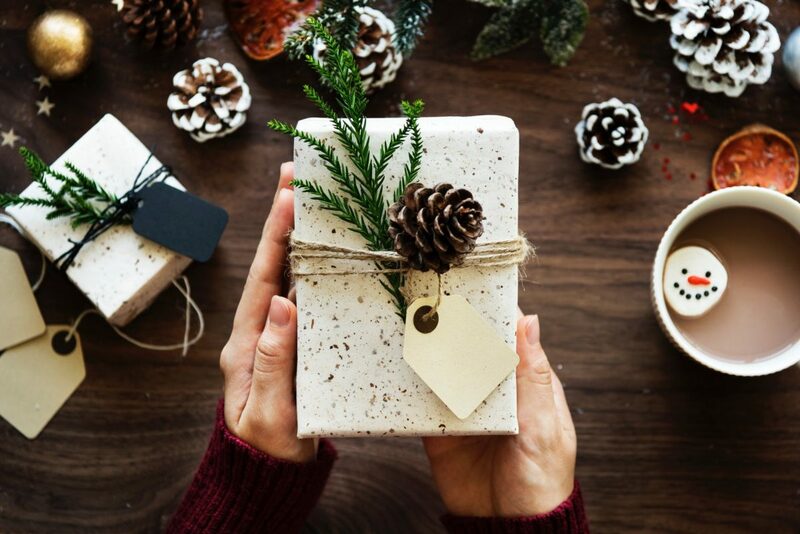 Now that we are all settled on time and when we should be preparing what we need to prepare to reach out, we need to ask ourselves–would this really make a great gift? I’ll give you an example. I was hosting a segment for the local TV station and one of the products that was suggested to me was a pretty cool app where you would input pictures and it would turn it into a photo album with pictures and video. Really cute idea, but it was $1.99, which is not really a gift. I mean, it’s a stretch to call that a gift when we’re talking about gift guides since we want to be able to wrap it and put under a tree. So you need to ask yourself, okay, is this really a gift? And again, That’s where the themed gift guides really come into play. For example, if you want to reach more entrepreneurs then think about a gift guide for entrepreneurs or a gift guide for women in business, something like that. You always want to ask yourself, okay, am I trying to promote this too much? Is this really a gift? You just have to go about it with the right angle. So again, with that $1.99 app, a better angle than a gift guide for everybody in the family would have been gifts for app lovers or different apps that make great gifts or gifts under $5 so it can work. You just need to be creative in a way that makes sense and think, would this product or service work as a gift and who would want it. You want to make sure you’re not earning coverage for the sake of earning coverage, but who is your gift for? Is it for entrepreneurs? Is it for moms? Is it for dads? Is it for expected parents? The more specific you can get, the better because maybe that will help you get inclusion and it’ll help you show up higher in a search. So be as specific as you can. Okay, so now you know when to pitch. You also know what makes your product or service a great pitch. You kind of know now what angle to go with to get that publicity. So here’s the big question. How do you find those gift guides? There’s a couple of ways to do this. The first way, and probably the easiest way, is to Google search last year’s gift guides. Let’s say your group is business owners then search ‘gift guide for business owners’. Again, the more specific you can get, the better, and you’re going to find things in that Google search. Many times when you click on an article, you will see in the byline the name of the person who put it together and how that name is linked. It’s either linked to that person’s Twitter profile or it’s linked to other work that the person did for that same outlet. Many times you can use that name and find that person’s contact information or if it is their Twitter profile, start building a relationship with them on Twitter and just say, “Hey, I found your gift guide from last year where you did a roundup of about 15 different products or services that were a great fit for new moms. I would love to share with you my product or service if you are doing a similar gift guide this year.” Don’t just leave it at that, actually share your product or service with them. Journalists are overworked and underpaid so they don’t want to reach out to you for more information. Instead, they want you to just give it to them. Again, service can get tricky, so if you can productize your service, that’s going be your best bet, so include the name of your product and a short description of it. Now, don’t get crazy here – just two to three sentences about why your product is a good fit for that gift guide or for that outlet, not what you love about it or why it’s amazing – just why it’s a good fit for that audience and where they can find it. Because again, the point of this is to get a link back to your website. Sometimes they’re going to want an image of it. Many times they’ll just go to your website and they’ll grab something that works, but if they want an image, attach an image. Otherwise, you can just link to some images or just the link to your website and say, “Hey, there are tons of images here for you to use.” That is going to be your best bet. So Google search last year and reach out to the person who made that list. Another idea is to find your target outlet because just about every single outlet does a gift guide. Another way is to pick exactly where you want to be is either look for a past gift guide there or pitch them a gift guide or pitch yourself for inclusion in a possible gift guide. The third is by using HARO which stands for “Help A Reporter Out”. Basically, it’s a service that a lot of journalists use where they have their story, they know what they’re going to write about, but they need help getting the information or to produce the TV segment or even to produce the podcast, whatever it is. So you sign up for HARO to help these journalists out. When you do sign up, you will get an email every morning, afternoon, and evening and it will have about 60 different queries in it divided by topic. So if you are interested in education, you go to the education topic. If you’re interested in business, you go to the business topic. If you’re an expert in travel, you go straight to the travel section. There’s probably about eight different topics with anywhere between four and eight different queries under each topic. I suggest looking at all topics just because your expertise could be in travel, but there could be a business question under the business section that has to do with travel. You never know where you could use your expertise to pitch a different angle that maybe you didn’t think of. Anyway, back to gift guides with HARO. People are constantly posting, “Hey, I’m doing a gift guide for entrepreneurs for Dads for this or for that so send me your products”. Be careful though because many people use HARO to collect free stuff and you don’t want to just be sending samples of your product to journalists or bloggers who are looking for freebies. So if you’re going to use HARO to get gift guides, ask questions. Many times on HARO, the user needs to provide the outlet of who they are writing for. So if you see it’s a major outlet, then yeah, that sounds good. Because again, you’re not paying for this coverage, but if you’re going to be sending out different samples and different products for coverage, that is money out of your pocket. So with HARO, you want to do your homework before you spend time or money executing anything. Okay, now we know when to pitch. We know how to pitch. We know how to find the gift guides. So now we’re actually going to draft the pitch. To start, if you used the tactic of searching for the holiday list last year, then you’re going to mention that in your pitch. Start your pitch by saying, “Hey, I noticed you did this last year. Are you doing it again this year? If you are, here you go.” You always want to include why it makes a great gift to include but again, if you are overly promotional and you just talk about how great it is and how great you are, then it’s not going to work. You have to think of the audience and why it’s a fit for them. Again, going back to those bloggers who are looking for freebies, if it’s something that maybe they just want to keep for themselves, ask a question or two that would make that obvious to you. You can check that stuff online. I mean there’s plenty of websites. One that I use is called Similar Web, where you copy and paste a link to a blog, and it’ll tell you what their traffic is. For example, if their traffic is 5,000 visitors a month or less, it really won’t register anything. You just have to ask yourself if it’s worth it. And then finally, the last tip that I have for you is to follow-up, and I know this is what people tell you with everything in life and everything in business, but if I had to show you what a journalist’s inbox looks like, you’ll understand why I’m telling you this. We’re talking hundreds and hundreds of emails every single day. So when you follow up, you’re pushing yourself back up in that inbox. You’re reminding that journalist that you’re there and you’re putting a little bit more pressure on them to get back to you. Whether or not it’s a yes or a no, it’s just good to know. So you want to follow up. I use the Boomerang Chrome extension for this and I will follow up once a week for four weeks. Your pitch should be so timely that after four weeks it does not apply; it’s no longer relevant. So I’ll follow up for four weeks and then after that it’s back to the drawing board or pitching new people. Most of the time people will take it and they’ll put it in their gift guide and you won’t know that if you don’t do searches. So I suggest setting alerts up through Google for your name, your product, maybe your business name, in addition to your proper name. I can’t tell you how many times I think I’ve captured all of my clients’ media hits. And then I’ll do a Google search and I’ll filter those searches to the last 24 hours or the last week or the last three months and I find so many other things that I missed just because either the Google alert didn’t pick it up or the journalist didn’t get back to me to tell me that it aired or it was published. So you want to make sure that you’re constantly monitoring your brand online because you don’t just want to get the publicity and leave it. That is the biggest mistake that people make. You need to do PR on your PR and that’s where you’re going to see the profit from the publicity. I can tell you I’ve earned myself and my client’s tons of publicity, but where we actually see that ROI is when we share that publicity on our website and repeatedly on our social media. Plus, there are so many different schedulers that you can use on social media that you can really just set it and forget it. I use SmarterQueue for this and I love SmarterQueue because I can share the same thing multiple times without scheduling it multiple times and I can set it to expire after a certain date. For example, if I’m in a gift guide today, I can share that link to schedule and then I can set it to expire on Christmas Day. So it’s posting multiple times over the course of a month and a half and I’m not scheduling it multiple times. This is a lifesaver. I remember I used to schedule social media posts. I think like every couple of weeks I would sit down and say, ‘okay, I’m going to schedule my social media posts for this week or next week’ because it’s just not realistic to be on all of them all of the time, but you definitely do want to have a presence all of the time. Wherever your ideal customer or client is, you want to have a presence there all the time because it’s a constantly moving feed and if somebody logs in at 1:00 pm, they’re going to miss everything you post in the morning depending on the algorithms. Or maybe you go on vacation for a week and you want to unplug and those people are wondering where you went. So it just makes it super easy. I love SmarterQueue. I won’t use anything else so make sure you check out the show notes above if you want to see how you can turn your post evergreen. It’s not just for sharing the media that you’re earning, but for anything on social media and even your own content marketing. If it’s not an obvious gift, what angles could you use to make it look like a gift for a gift guide for a certain audience… and then do Google searches. Look at those outlets where you want to be to get in front of your ideal customer or client and check out HARO (do your homework because anybody can post a query on there) and then draft your pitch all about the audience. It’s not about you, it’s not about your product. It’s not even about the journalist. It’s all about that audience, and don’t forget to follow up once a week until Christmas. I hope to see many of you in gift guides this year for your products. If you don’t have an obvious product, turn your service into a product. You could do that with a coupon code. Maybe you’re a business coach with a planner. I know I have clients who have planners. Maybe it’s some kind of strategy session. I know I’m putting together a gift guide now about non-materialistic things, so we’re not talking necessarily about products. We’re talking more about experiences. So think outside of the box for these gift guides. If you don’t have a product, you can still earn coverage as a service. I hope you enjoyed these holiday marketing ideas and I do hope you come back next week because I am talking to somebody who has a great product for a holiday gift guide. I’m actually going to include hers in something that I am writing about holiday gift guides and she has a subscription box business. I’m not going to tell you what it is. I’m going to wait until next week, but it is pretty cool and it’s a great interview, so I hope to see you next week and I hope that you block off some time even if it’s just one hour a week to work on these holiday marketing ideas so you can start getting in front of a new audience for your product or your service. And don’t forget if you want some more marketing ideas year round, not just for the holidays, no matter what your business or brand as you can always get more help in my three-day media class, “Pitch. Publicity. Profit.”, and you can access that at mediamavenandmore.com/publicity.